160 pages | 13 B/W Illus. While there are certainly numerous influences on individuals’ learning and performance, cognitive strategies are the processes most directly related to making meaningful progress on a learning task or problem. Written by a leading expert on strategic processing, this book situates the topic within the broader context of educational psychology research and theory and brings it to a wider audience. With chapters on the fundamentals of domain-general and domain-specific strategies, connections to other constructs, and advice for instructing students, this concise volume is designed for anyeducation course that includes learning or study strategies in the curriculum. It will be indispensable for student researchers and both pre- and in-service teachers. This is a key work in helping the intelligent public understand the research on cognitive strategies. 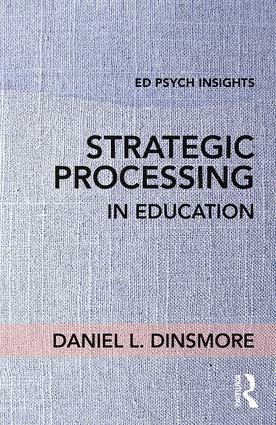 Dinsmore writes in a clear and accessible style, with plenty of examples, to help illustrate the value and practice of strategy instruction in the classroom. He does an outstanding job of organizing the large and disparate field of strategy research into a concise monograph for the practitioner audience. This book is a must-have for any student or teacher interested in developing their skills as instructors or formulating a program of research on strategy use. Dr. Dinsmore’s expertise and practical experience are on full display in Strategic Processing in Education. He has a structured a book that makes the content both accessible and informative for a diverse audience. It is a must read in any education course that includes learning strategies and a valuable resource for teachers who would like to learn more about strategic processing. Chapter 1: What is Strategic Processing? Daniel L. Dinsmore is Associate Professor of Educational Psychology in the Department of Foundations & Secondary Education at the University of North Florida, USA.